Over the years, there’s been a steady rise of out gay superheroes in both Marvel and DC’s rosters — and now that number has grown a little larger, with the revelation in tomorrow’s All-New X-Men #40 that one of the founding members of the X-Men is gay. Spoilers, of course, for All-New X-Men #40 below! The revelation comes from scans of the comic, due to release tomorrow, which were posted to the 4Chan message board last night. If you’ve not been following along, the premise in All-New X-Men is that young versions of the original X-Men team — Jean Grey, Cyclops, Beast, Angel and Iceman — have travelled forward in time to fight alongside the current members of the Mutant squad. Marvel’s mutants have long been symbolic representations of minority groups, with stories of discrimination and segregation being core aspects of X-Men stories for years. 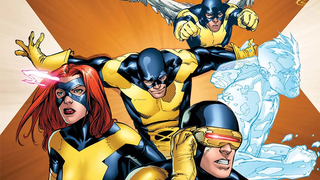 As LGBTQ rights across the world have progressed and become an important topic for debate, it makes sense that the X-Men have begun to incorporate a diverse roster of gay characters too, especially now that it’s including some of its most prominent members. It’s not the first time the X-Men have been part of the discussion about gay rights either — let’s not forget that the first gay wedding in Marvel Comic’s history was between the mutant Northstar and his partner back in 2012.